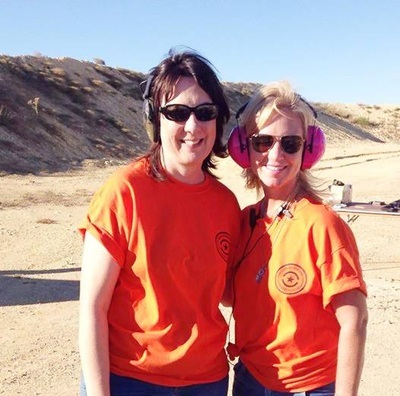 In October 2014, approximately 200 women gathered at a range outside of Atlanta to participate in something that had never been done before. 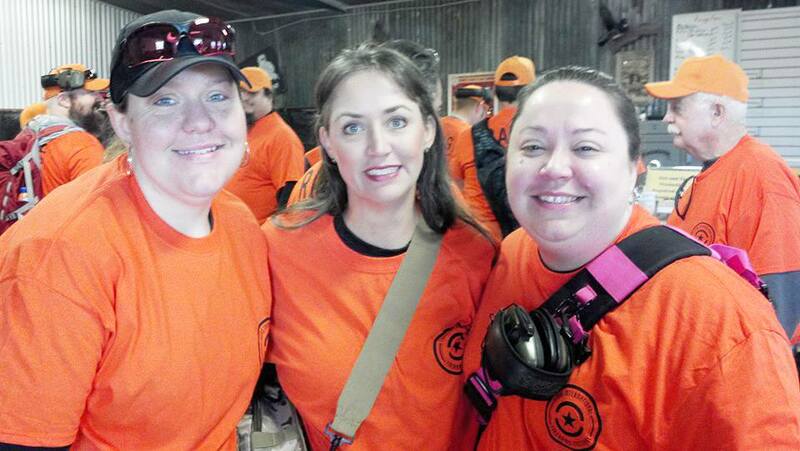 The Brownells Ladies 3 Gun Pro-Am Challenge was the first 3 Gun match organized by women for women only. Though, I am certain it won’t be the last. These women came from all over and represented every level of shooter. 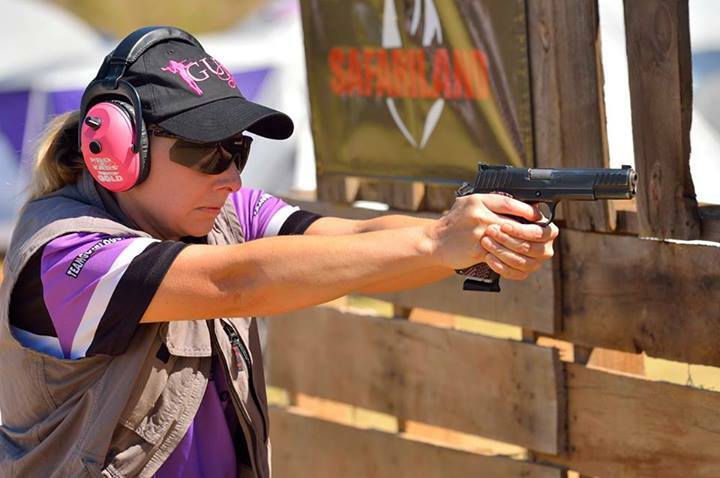 From the PROs to the AMs, there were women who shoot 3 gun almost every week and are highly ranked to women who had never shot competitively until the moment they decided to register. 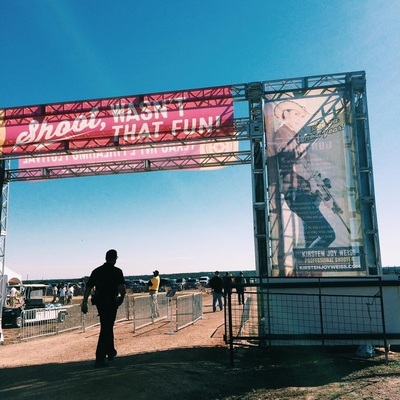 3 Gun is a particularly intricate sport utilizing a shooters ability to transition between 3 types of firearms - pistol, rifle, and shotgun – while engaging various types of targets, in complicated courses of fire, and all while being timed and tested on accuracy and proficiency. Much like the rest of shooting sports it has mostly been dominated by men, however, women are falling in love with the action and challenge of the sport. 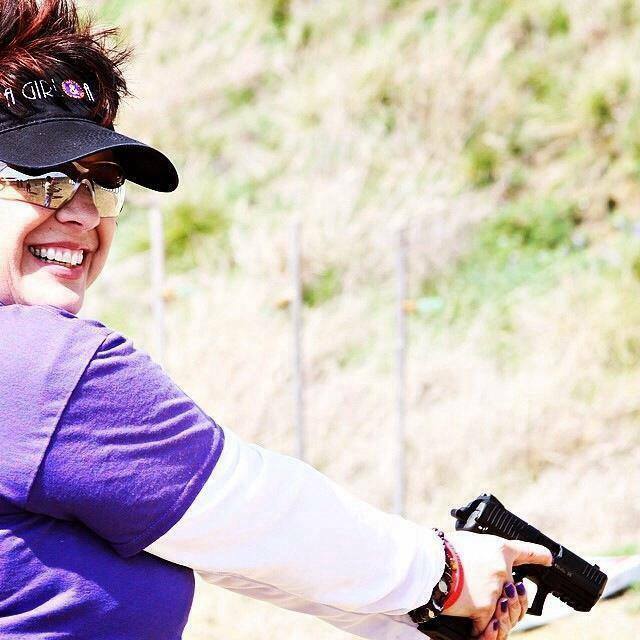 Lisa Marie Judy is no stranger to competitive shooting, or organizing competitions. She worked with Glock in 2011 to create the Palmetto Glock Girl Shootout, one of the first of its kind. She is a competitor, a trainer, and obviously a huge supporter of women shooters. 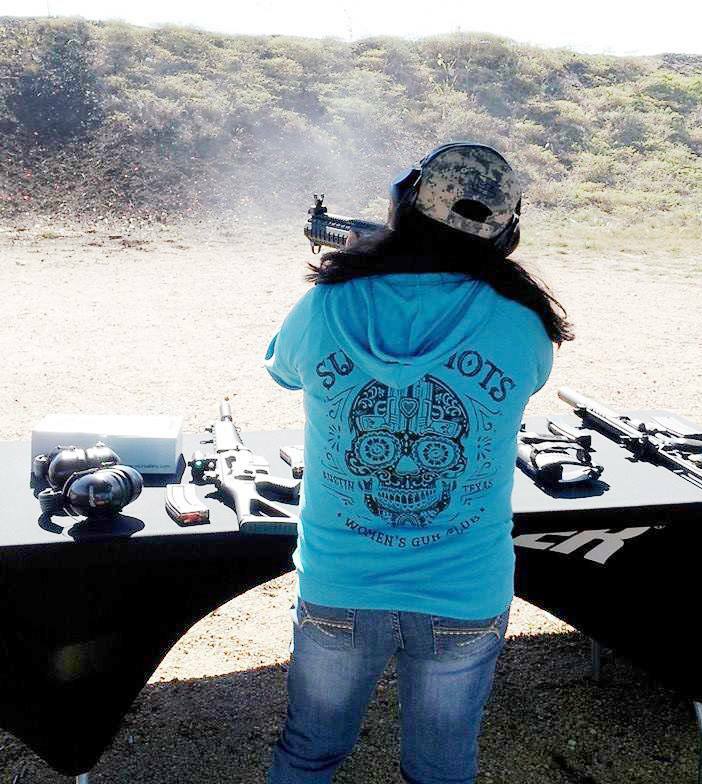 She started training for 3-Gun in 2013, and worked as an assistant to Rob Romero, 3-Gun Nation's Director of Competitions. That experience led her to dream of a ladies only national major match and she approached Kay Miculek to team up on making that a reality. 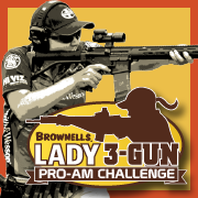 With Lisa Marie as the Match Director, they created the first ever all-ladies national 3-Gun major match - The Brownells Lady 3-Gun Pro-Am Challenge! 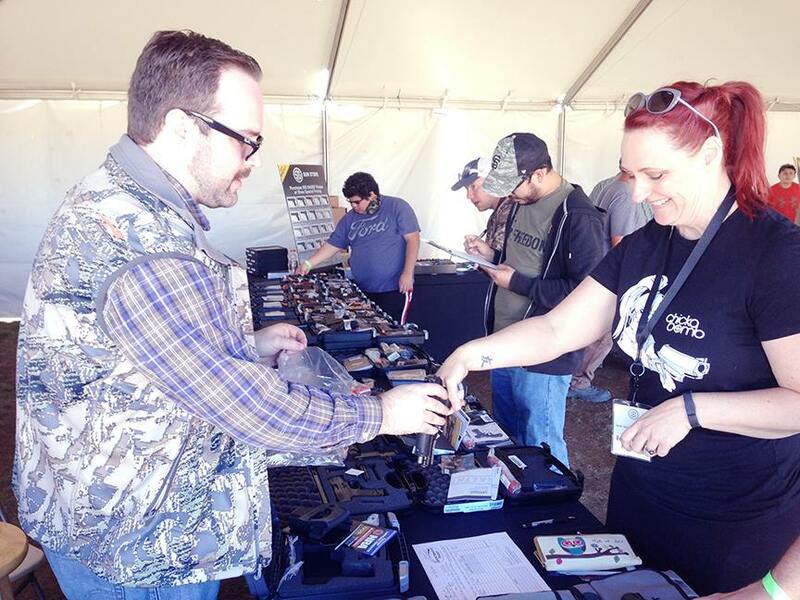 In preparation for the match I organized and assisted in teaching several Introduction to 3 Gun Classes around the nation. Teaching is what she enjoys doing most and, as she says, she finds "it very rewarding to share with new shooters the knowledge and skills it takes to become a competitive shooter". The women that competed in the Brownells Ladies 3 Gun Challenge were split up into squads. 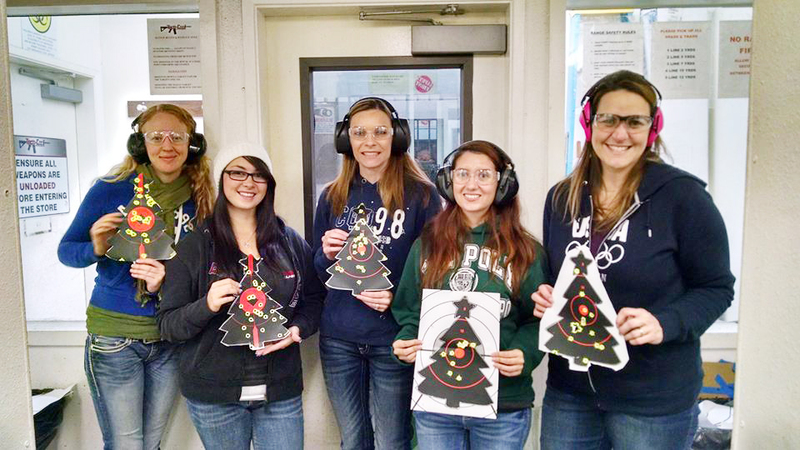 Lucky Squad 13 had a great mix of women with different skill levels. It also happens to be the squad that I was signed up to compete with, unfortunately, I couldn't make the match, but I asked a few of them to share a little about themselves and their take on the match. 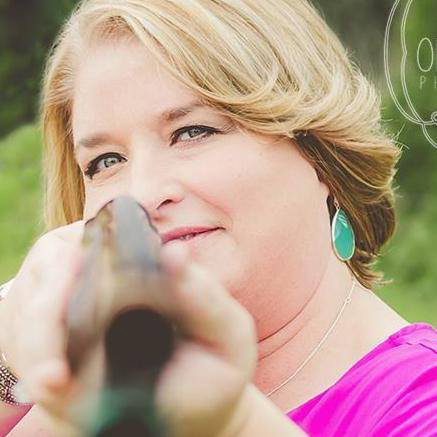 Jonti is a lady with a great attitude and sense of humor who grew up around firearms, plinking, shooting snakes out of the family’s stock tank, and was even on the 4-H Rifle Team in high school. Despite that she spent a number of years without shooting in her life. 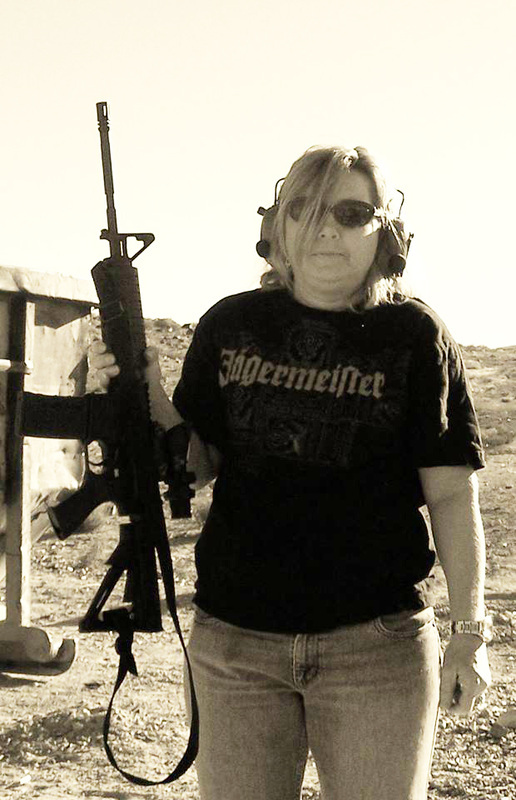 In 2009 something clicked, she knew it was her right to own a gun and she wanted to exercise that right. 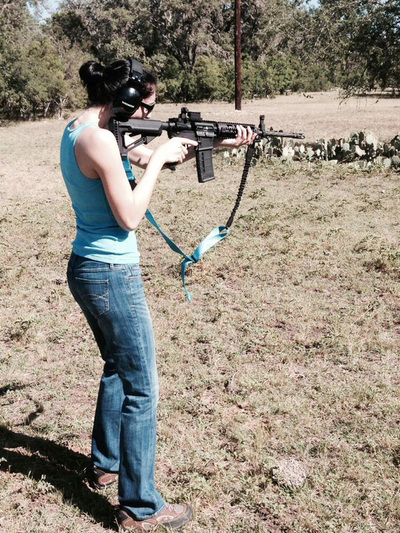 But she also knew if she did, she needed to do it responsibly so she started training. 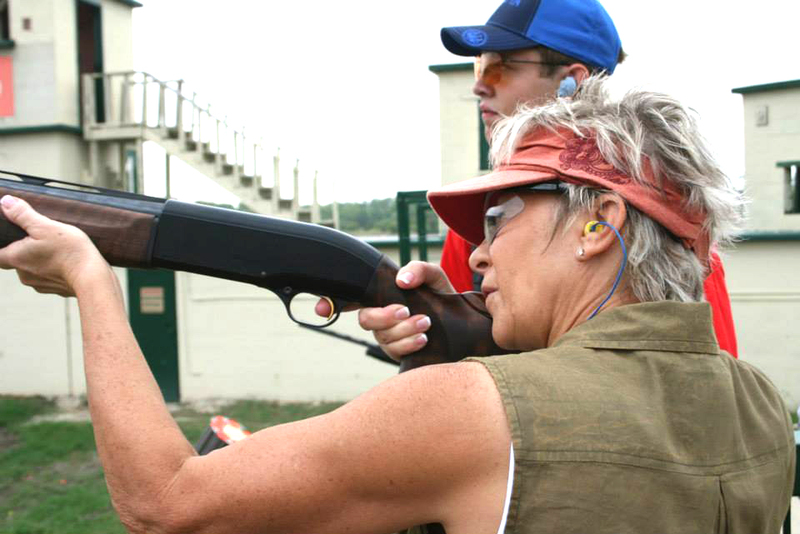 In 2012 she rekindled her relationship with competitive shooting, and has influenced other women to do the same. 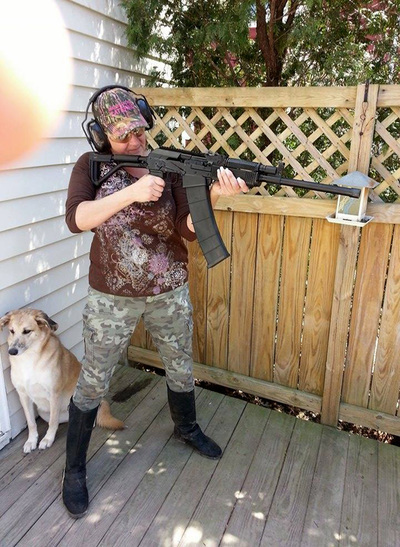 She found out about the Ladies 3 Gun match via the internet. Taking a leap of faith, she registered and even challenged a couple of women from her A Girl & A Gun chapter to do it too. In order to get ready for the match she spent some time prepping her mind and body. She upped her cardio to help with endurance, and she made adjustments to her busy schedule to make time for local matches. 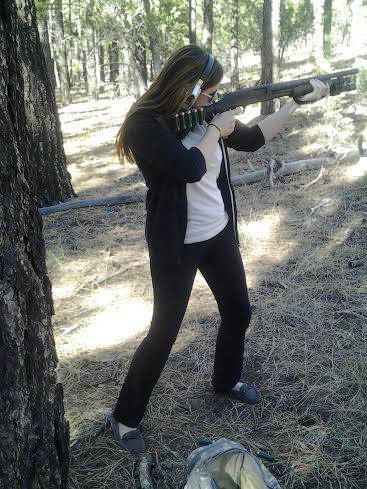 She also worked on shotgun loading, which seems to be a common theme with these ladies. 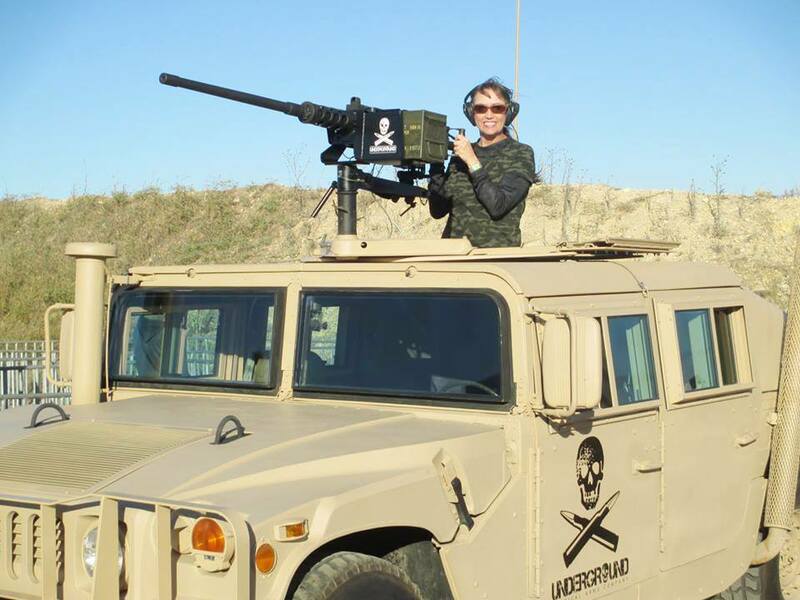 She shoots in the Tac-Ops division, and calls herself the "epitome of Amateur". Her competition equipment for this match included: Glock 19 with grip reduction, Mossberg JM 930 Pro, and AR-15 M&P T with a Primary Arms 1x6 scope. Like many of the women who participated in this historic match, Jonti was excited to meet such a diverse set of women with a similar interest. 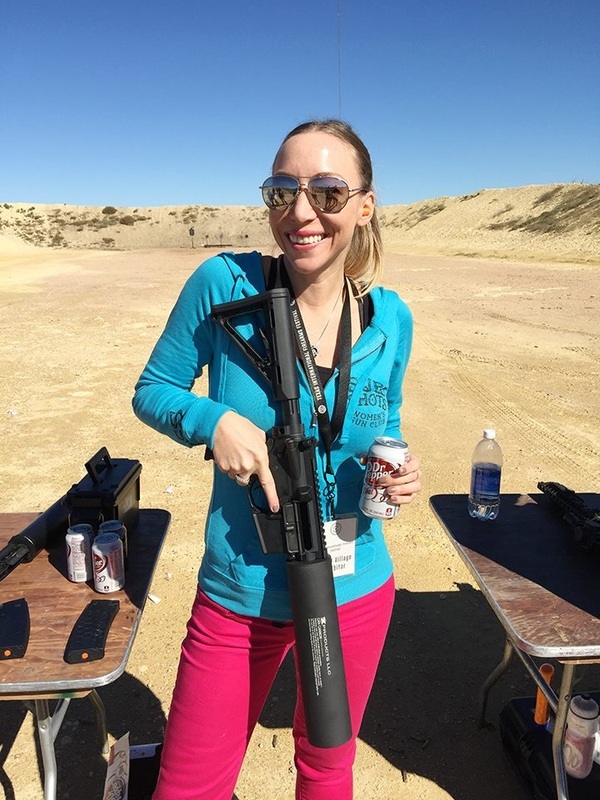 While she enjoys competing with men, there is a lot to be said for shooting with 200 women on the same range with many people from the industry looking on. After falling in love with shooting in 2009. 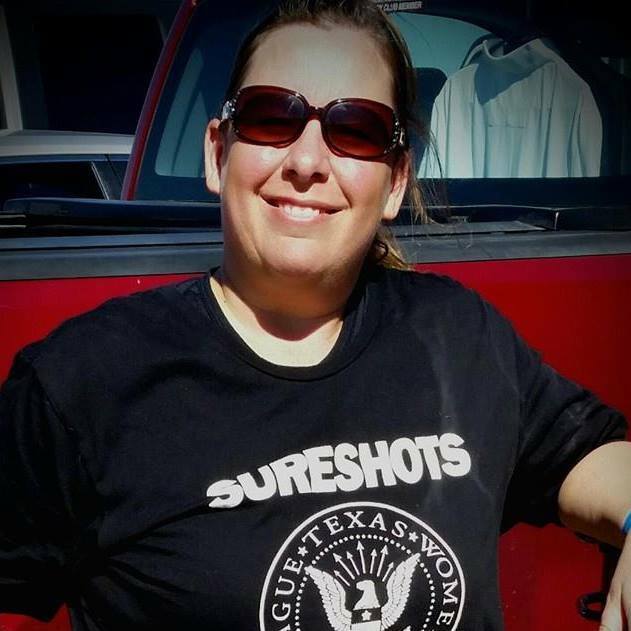 She had the opportunity to attend a Babes with Bullets class that set her on the path of competitive shooting, she’s been competing at USPSA & IDPA matches since 2010. 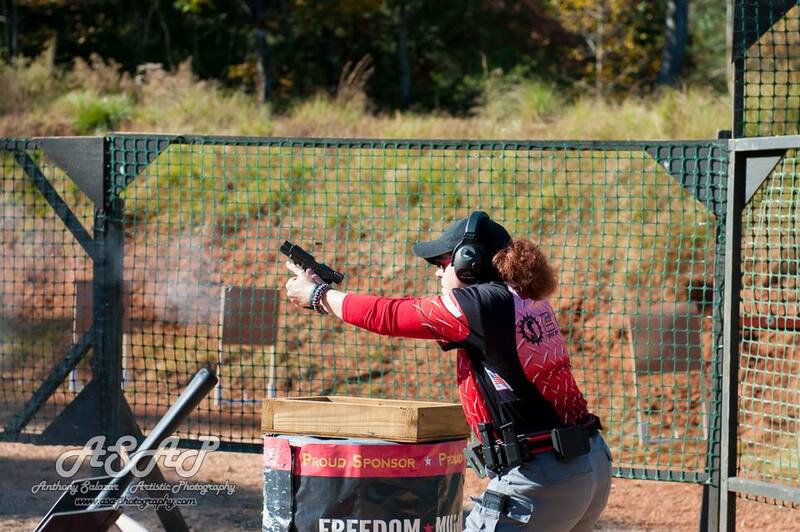 In 2013 she attended the Rockcastle Pro/AM 3-Gun match as part of the Babes with Bullets 3-Gun Challenge. Her lack of experience with rifle and shotgun didn’t prevent her from enjoying herself, and she was glad she competed. 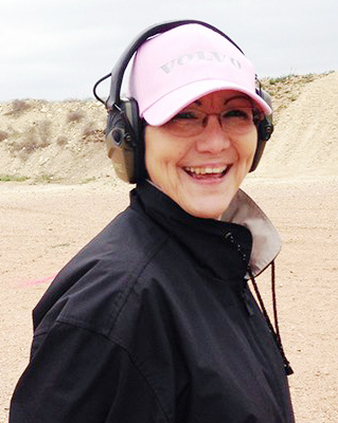 The Lady 3-Gun event popped up on her radar at SHOT Show 2014, and she immediately made it a priority to attend. 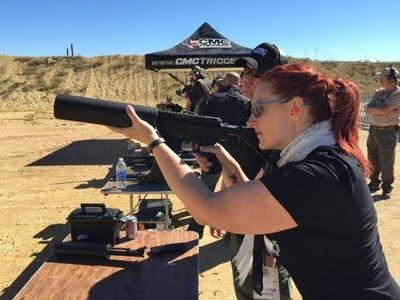 Jacqueline shoots in the Tac-Ops division as an amateur, her competition equipment for this match included: Springfield XDM 5.25 9mm pistol, Mossberg 930 JM Pro shotgun, and STI AR-15 that she built herself. 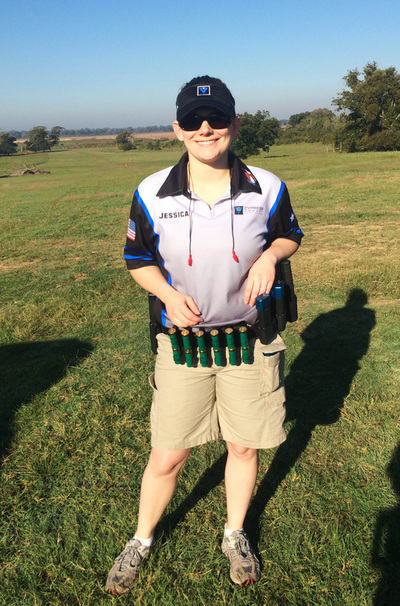 Jacqueline’s pistol match schedule keeps her really busy, but after a little procrastination she shot a few rifle and pistol matches in order to prepare for the Ladies 3-Gun match. Sometime in September she started working on her shotgun skills with dry fire and reloading exercises. Britney Starr is the owner of Starr & Bodill African Safaris and the Managing Editor of Women's Outdoor News. Having been a hunter and shooter for most of her life, 3 Gun competitions seemed like a natural “next step”. 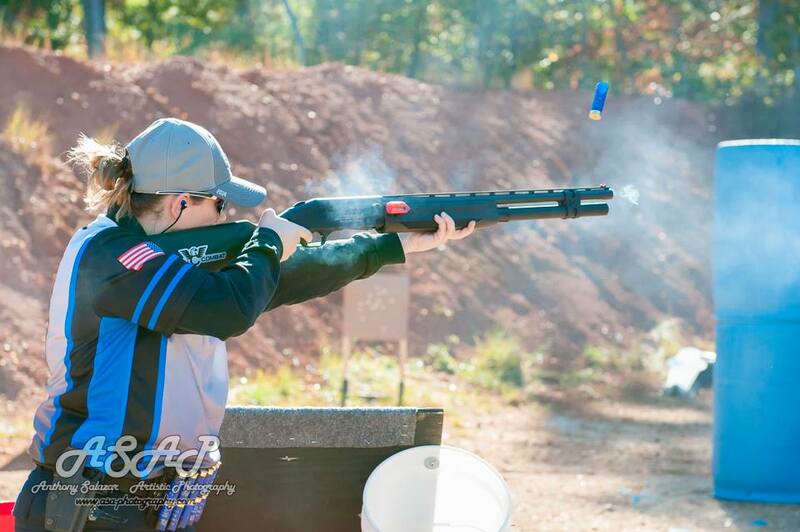 Britney has been competing in 3 Gun matches for about a year, shoots with Team 2 Vets Arms, and has the support of many other sponsors. 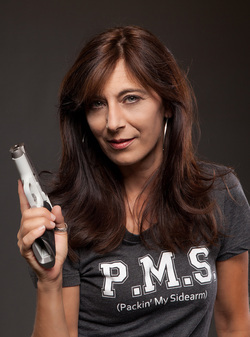 She is friends with Lisa Marie Judy and was aware that Lisa was working on a 3 gun match for women only, and she wouldn’t have missed it for the world. 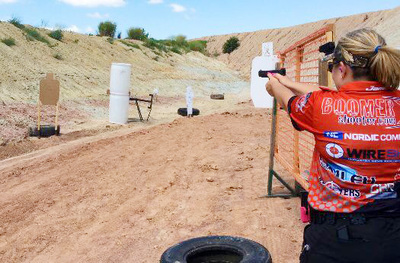 Britney has many opportunities to shoot, but spent some time specifically with her equipment in preparation for the Ladies 3 Gun. She zeroed a new rifle, practiced some offhand rifle drills, and in general, just burned powder with all of her guns. 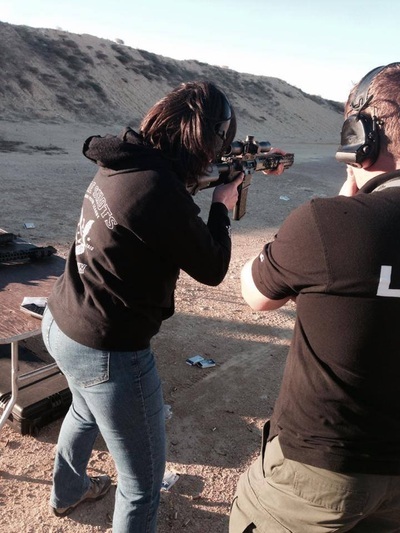 She shot in the Tac-Ops division as an amateur, but from now on she will be Pro! 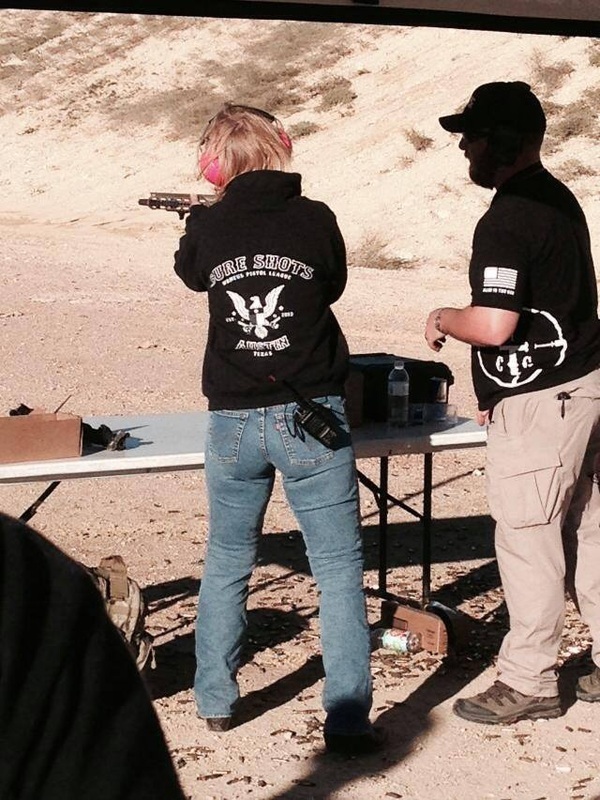 Her competition equipment for this match included: Glock 34 with ZevTech trigger and custom modifications, Beretta 1301 Competition 12 guage shotgun with Nordic Components extension tube, and custom 2 Vets Arms LRRP 5.56. 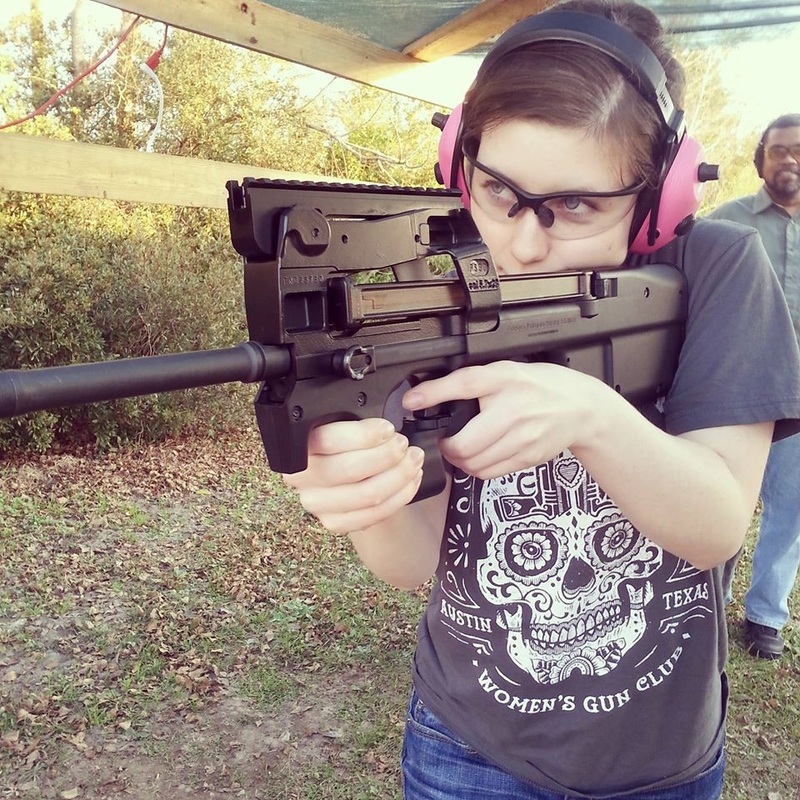 After catching some videos of the infamous Katelyn Francis shooting at 13 years old, Jessica knew she wanted to try it! She looked for some gun clubs and found A Girl and a Gun, a women only shooting group. That appealed to her and she has enjoyed the training opportunities AGAG has given her access to. 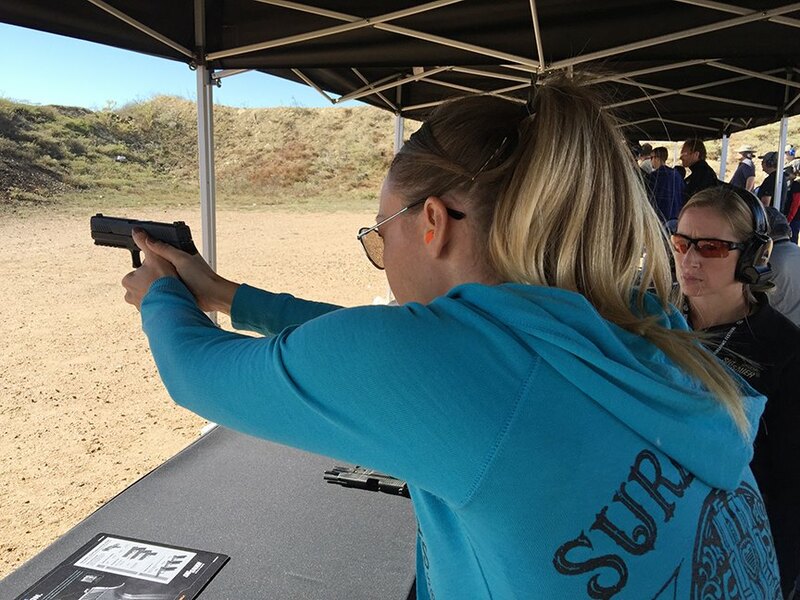 Not only has it made her a better shooter, but it has introduced her to what she calls “the nicest group of people I’ve ever come across”. Having this camaraderie while learning to shoot has given her the skills and confidence to carry a firearm for her and her families’ protection. 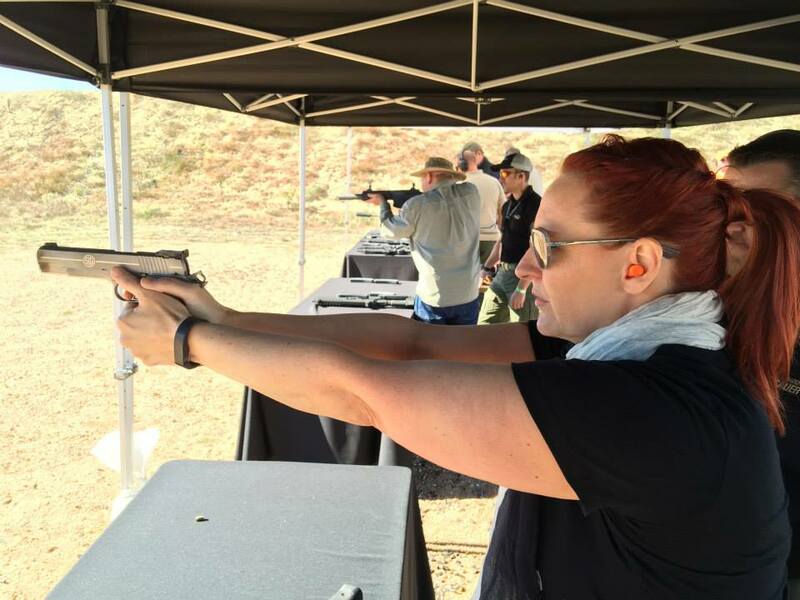 While shooting and training regularly she started following the ladies pro series and shooters, which is how the Brownells Ladies 3 Gun Pro-Am Challenge came to her attention. After researching the match she told her husband and a friend about it, they encouraged her to go for it. 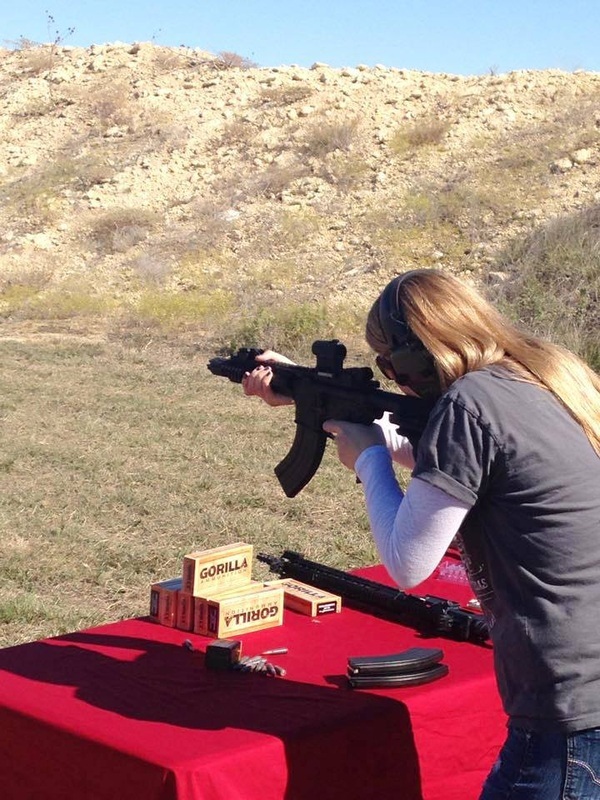 Upon registering for the match her nerves hit her, this was going to be big. 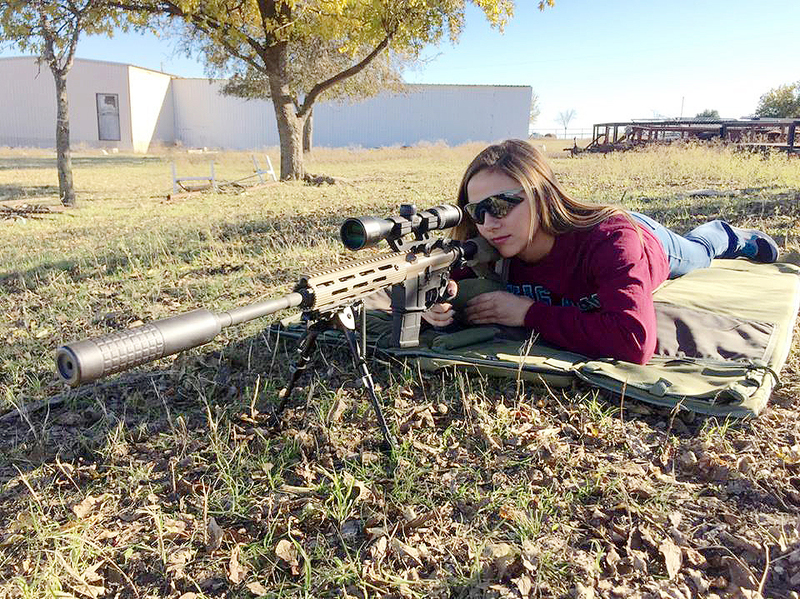 Leading up to the match Jessica practiced at least once a week, and has been training with Steve & Donna Vandermolen of Conroe Shooting Academy. 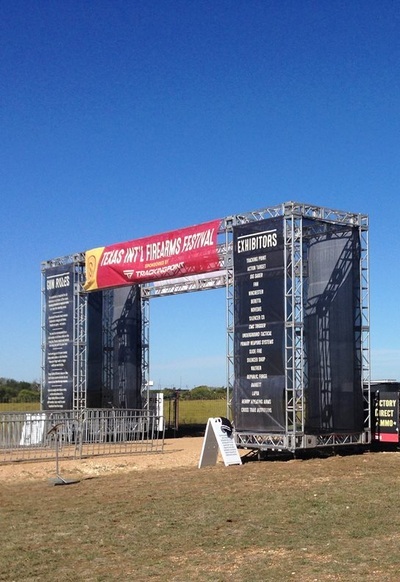 They created scenarios and stages that helped her learn to run stages, think outside the box, and pushed her limits. 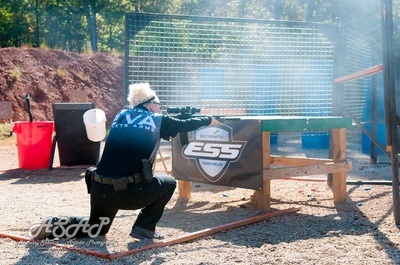 She shot in the Tac-Ops division as an amateur, her competition equipment for this match included: Glock 34, Mossberg 930 JM Pro, and Stag Arms/Wilson Combat AR-15. Before the match Jessica was most looking forward to having a good time. Jessica, as well as many of the ladies who participated in the match, want to see more women in the shooting sports. She knows that if we can encourage more women to shoot in matches they will have fun, gain confidence, and be more comfortable if they choose to carry a firearm for safety. My first night at Sure Shots was April 10, 2013. 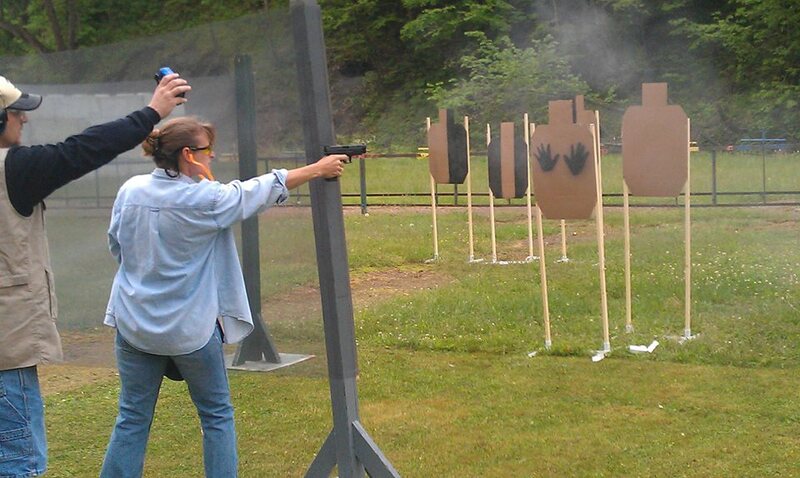 I had just taken Ladies-Only Defensive Pistol 1 with BSG on the Sunday prior, so I was excited to go to Red's Indoor Range that Wednesday for my first Sure Shots practice. Not knowing anyone, and still a bit apprehensive, I was welcomed and was glad Kent, BSG’s instructor, was there line coaching, as well as Niki—two familiar faces from Sundays training. Once on the range, Kent reinforced what I’d learned Sunday: "Take your time and make it count.” He helped me with my stance, something I still struggle with, and grip. I came to this group a green pea, not knowing much at all, but I have learned so much through all the training and everyone's help along the way. 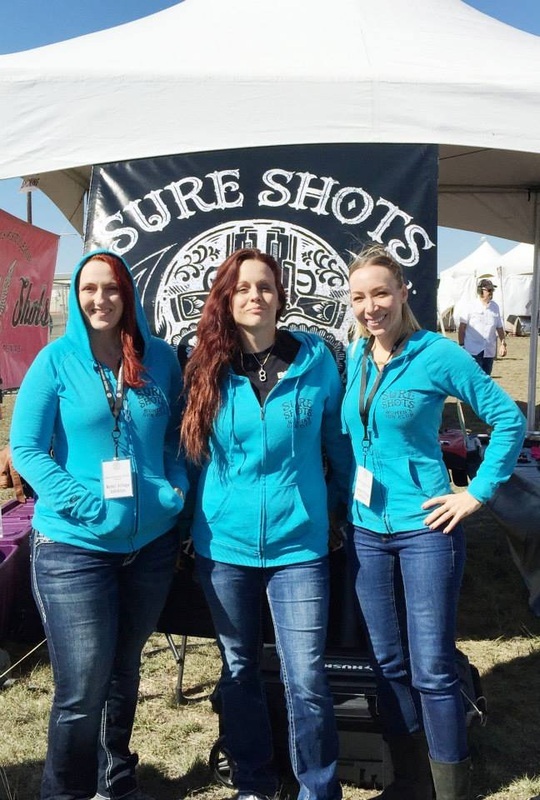 I have met so many awesome people who love to help the Sure Shots and give their time so freely. 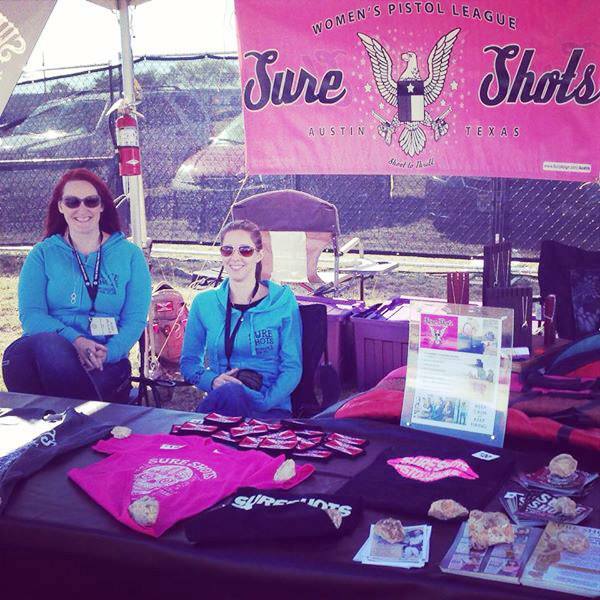 I have met awesome ladies, all who love to help, share gear, their pistols, and lots of knowledge and encouragement. 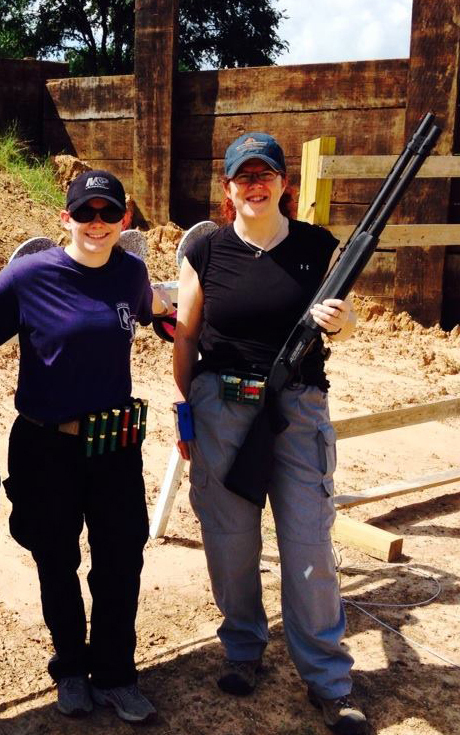 I never thought I would make as many friendships as I have, or fallen in love with shooting and the thrill of training! I now have my CHL, frequently attend gun shows, wear skull and gun tee-shirts, and want more! I have a new family with my Sure Shot sisters! It has been an exciting ride, and the best is yet to come! 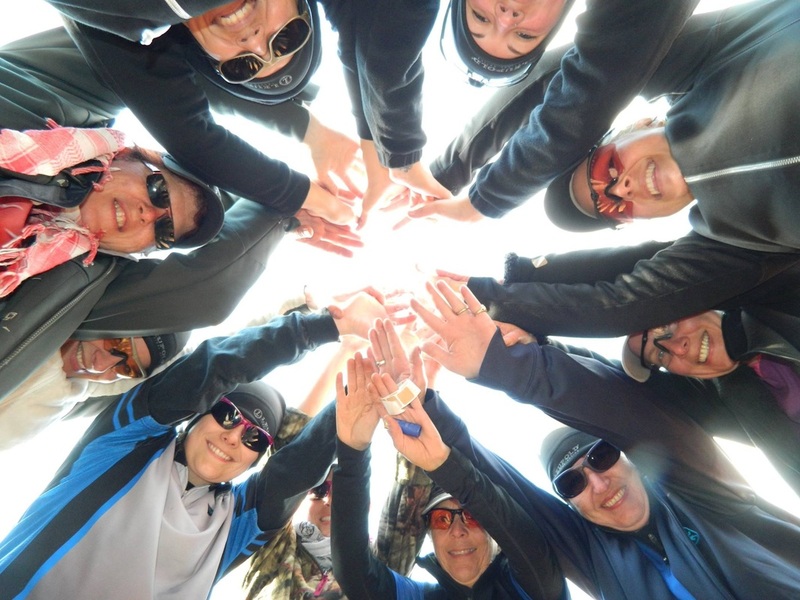 2015 will be a year of more fun and training… I encourage everyone to come join us and be a part of something really awesome! 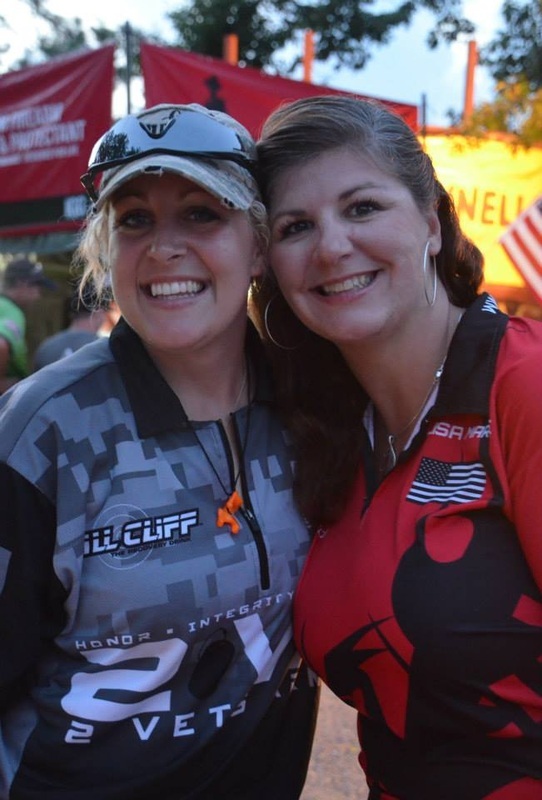 This month in our spotlight of Women in the Industry, we would like to introduce you to the owner of OffHand Gear, SANDI KELLER. 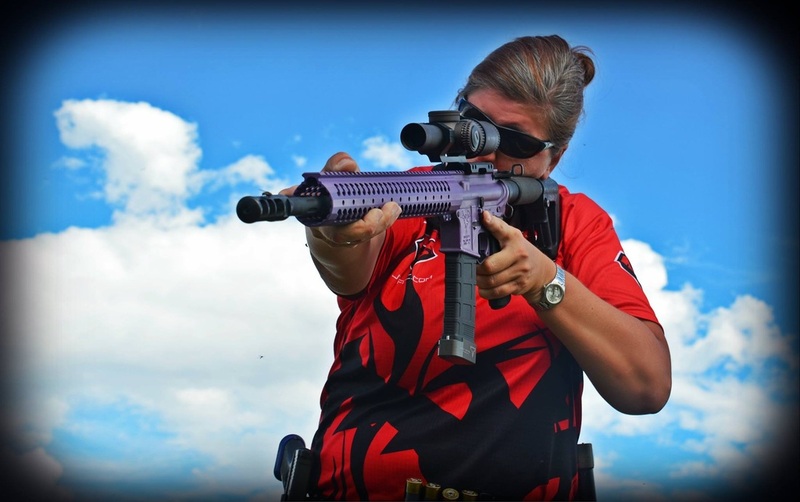 This supercool lady designed two of the most exciting products we’ve seen lately: the OffHand Gear Fleur D’Lis Hand Guard, and the NORB (No Ordinary Range Bag)! Sandi Keller: OffHand Gear is all about us ladies. 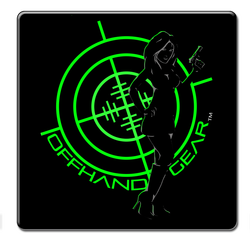 Many companies are coming around to the fact that we ladies are here and bringing girly colors to their line but I am trying to take things to the next level with OffHand Gear and design products around our size, shape and needs. SK: Right at 2.5 years. SSM: Have you always been involved in the shooting/tactical/firearms community? SSM: Please tell us a little bit about yourself and your background. SK: Up until OHG I wasn’t all that focused. 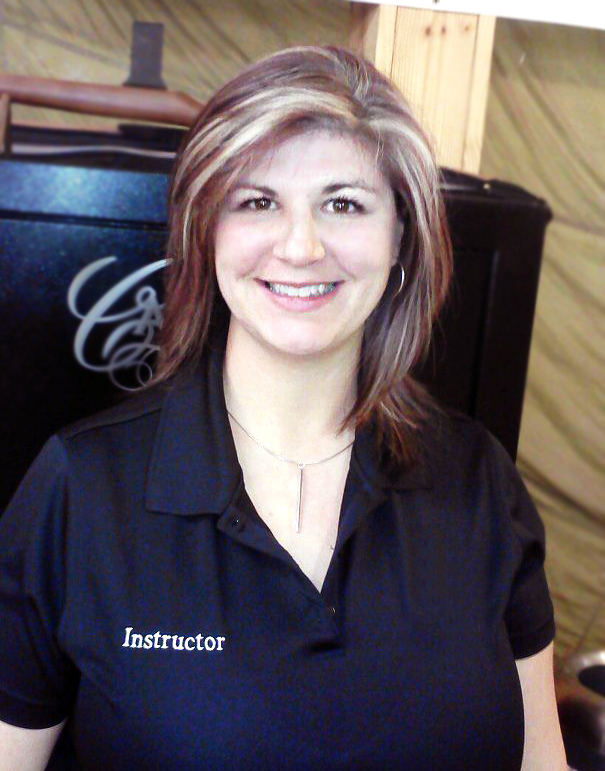 My trained background was in bookkeeping and then when I was the bookkeeper for an interior design firm found my passion for design. I soon opened my own small retail showroom and did Interior decorating for some custom builders before moving to Arizona. I left that industry when I got pregnant with munchkins number 3 and 4 and fell back on the bookkeeping for a few years before starting OHG. 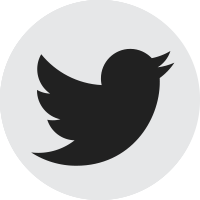 OHG is the perfect balance for me with the logical business side of things while doing the design side, which I so love. SSM: What made you decide to start Offhand Gear? SK: Need and want. It was frustrating not finding products for women. I mean, there were and are products out there, but so many not designed with women in mind. Not just what we like, as in color or style, but taking our bodies and needs into account too. 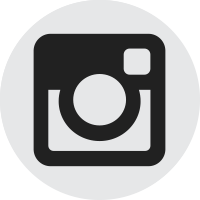 While the OHG apparel is fun, the core of OHG is the gear. Like NORB—NORB (No Ordinary Range Bag) was designed out of my frustration trying to find a range bag that didn’t look like a range bag, but also would accommodate all my stuff. I didn’t want to always have to carry my handbag and a range bag. 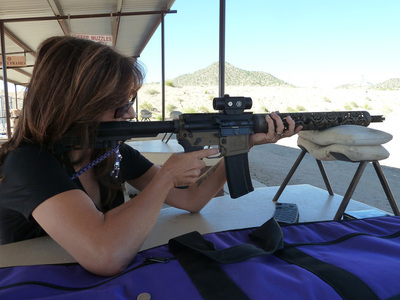 If I go to the range and need to stop at the store on the way home I didn’t want to have to switch my wallet, phone etc, all over back to my handbag, or carry a big ol range bag in either. CC bags couldn’t handle the weight of ammo and all the gear and range bags typically scream “Hey, I’m a range bag” So, I set out to design my own bag that was functional for us busy Moms and more incognito. SK: I don’t really think of this as a “job” – it’s really more of a passion and the best part for me is the creative side of it. I love spending hours at my computer working on a new tee graphic or brainstorming a new product idea. 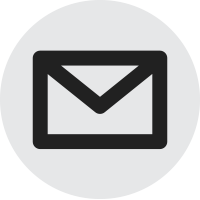 SSM: Have there been any lessons that your work life have taught you? SK: I have learned there is a difference between competition and being competitive. 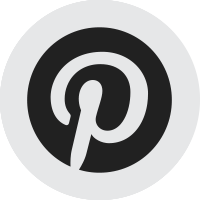 While there maybe businesses in this industry that are competitive business and trade secrets are not shared. There is a genuine desire to help each other instead of competing. I have made some friends in this industry that I will always appreciate and look to for advice. SSM: So, if you could choose anyone, who would you pick as your mentor? SK: That is easy! I had the privilege of who I would pick actually being my mentor – my Dad. He was the kind of man people would gravitate to and leave a job in order to follow or work for him. He not only knew business but also knew how to lead—before he passed away we would have Saturday morning business pow-wows—I miss those very much! SK: Sig Sauer P238. I really like everything about it! 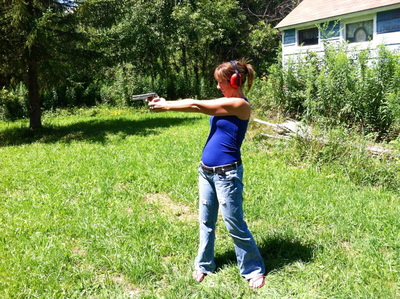 I was not willing to sacrifice my wardrobe so I needed a pistol that would be small enough for me to conceal as well as large enough to be able to control with a good grip. SSM: What are some important lessons you have learned while running Offhand Gear? SK: Oh my, there are many everyday. I would say the biggest one I am learning though is patience – being a company that is USA Made brings quite a few challenges with it and the patience and tenacity to keep pursuing how to bring a new idea or design to life while maintaining to be Made in America is a lesson I have to learn every day! 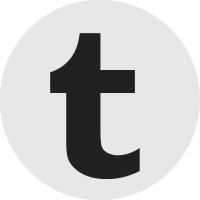 SSM: What do our readers have to look forward to in the future from Offhand Gear? 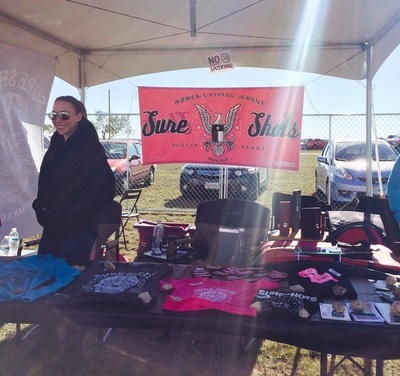 SK: More gear and apparel for women! 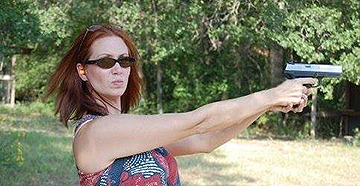 As I grow in my journey as a woman shooter so will the product line up. When I find a need then I get to the drawing board. My goal is to bring many more products to the table that are designed just for us. SSM: What is the best shooting advice you have been given that you feel might be important to share with our readers? SK: To get out there and practice, and practice often! 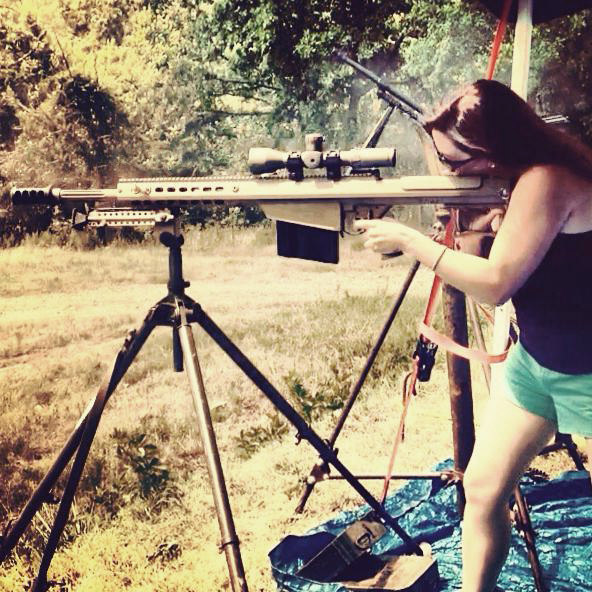 I find the more I frequent the range the more confident I am. I don’t just improve my ability to hit the target and have a nice group, but also gain the confidence and comfort to carry all the time and handle any malfunctions that may happen. 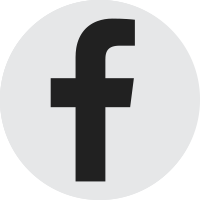 SSM: Where do you see Offhand Gear in 5 years? SK: My goal is to make OHG be the go to brand for great USA Made items for women. Grow the apparel into a more fashion statement line while also expanding the gear side of the business utilizing our partnerships with some really great companies in the industry. SSM: And for our final question… If you could be any character in a movie to be who would it be & why? SK: Probably the hardest question here. I am not a movie buff but my first thought is Jane Smith (Mr. & Mrs. Smith). Jane Smith is confident, intelligent, beautiful and sassy while still being able to work with and “partner” to get the job done. 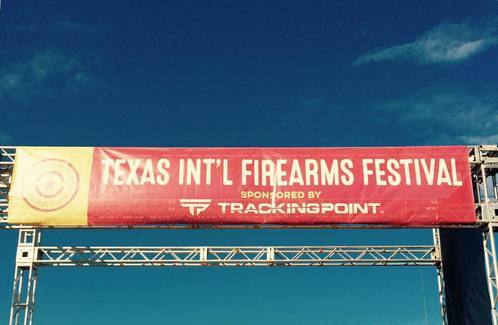 Photo from TX Gun Fest Facebook page.